Members of our program coordinate the Research Seminar Series in Science & Technology Studies. The series features seminars on a wide range of STS-related topics, and is sponsored by the Department of Science and Technology Studies. Now in its 17th year, the series has hosted over 500 speakers from Canada and around the world. It is open to the public, and STS majors are especially encouraged to attend. All seminars take place on Tuesdays from 12:30-2:00 in 203 Bethune College (Norman's) (unless otherwise noted) and are open to the public. Light lunch will be provided. Directions are available using the York University Map. Please click below to see the poster of previous seminar series. Abstract: When the full body of a woolly mammoth melted out of the frozen ground in Siberia at the turn of the nineteenth century, it was a singular specimen: almost one hundred years elapsed before another frozen mammoth was successfully collected in 1901. Since then, with the growth of Siberian infrastructure in the twentieth century, and the acceleration of climate change more recently, more and more frozen creatures—mammoths, rhinoceroses, horses, and bison—from the deep past are melting out of the frozen ground. This talk will situate the phenomenon of this geological flesh record—as opposed to a fossil record composed only of bones—within the recent turn in STS and the environmental humanities to the cryosphere and cold studies more broadly. Abstract: This presentation will introduce the framework and preliminary results of a research project that looks at the technological and infrastructural proposals developed by civil organizations. Of interest are proposals related to protocols, standards, and hardware communication networks, that are explicitly articulated with values such as social justice and human rights. Using theoretical approaches and concepts located at the intersection of Science and Technology Studies and Communications Studies, the research involves participatory observation in several spaces and forums related to global Internet Governance. Abstract: Mobilizing Indigenous experiences with and narratives about climate change through various media provides important insight for broad global publics about what it means to live with climate change both in the observable present and the predicted future. Representing and reporting on diverse Indigenous peoples however can be extremely challenging given that mainstream media narratives have often tended to reproduce stereotypes, ignore Indigenous peoples and knowledges, erase the ongoing impacts of colonialism, and/or frame Indigenous people as proxies, victims, or heroes. 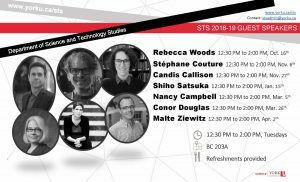 Drawing on research related to media from and about the Canadian Arctic, this talk examines how and where journalism might contribute to communal resilience, historical understandings of adaptation and climatic shifts, and reflect robust civic spaces and imaginations among global and regional audiences that include Indigenous publics. Abstract: Matsutake, the charismatic wild mushroom highly valued in Japan thrive in human-intervened landscape. Yet, it has evaded centuries of human effort at deliberate cultivation as they require complex symbiotic relationship with its living host trees. This talk examines the recently launched government-led “artificial cultivation” project. In particular, it focuses on the multidimensionality of interspecies and intraspecies translation practices of scientists and collaborating farmers. Their practices raise questions about what count as “artificial” and “cultivation” as well as human-nonhuman relationship. The multidimensionality of their practices place the project in ambivalent position between the manipulation of the fungus for capitalist resource extraction and the development of art of interspecies cohabitation as a response to the rapid industrialization, energy infrastructure development and climate change that the country has experienced since the mid-twentieth century. Abstract: Social movements have come to matter in Science and Technology Studies (STS). Harm reduction movements aim to reduce patterns of risky drug use. This talk examines the travels of naloxone, a narcotic antagonist used to revive those undergoing opioid overdoses. The talk situates naloxone as a “technology of solidarity” useful for animating lively selves. How did naloxone, an approved medical technology used regularly by emergency medical responders, move from a state of closure to one in which meaning was up for grabs? How did naloxone go from being an unfamiliar cultural object to a mundane “technology of solidarity” as overdose death rates have continued to rise in the United States and the United Kingdom? How did naloxone come to matter? Abstract: As our understanding of diseases and how to treat them evolves, so too must our decision-making procedures for providing treatments for those living with illness. Today, one area of policy that lags behind is that for treatments of rare diseases. Often the cost of drugs for rare disease (DRDs) are very high resulting in a significant challenge for the health care system - in particular the pharmaceutical reimbursement plans. What is more, there is a relative dearth of evidence -and thus considerable uncertainty- regarding the benefits and harms of such treatments. How then should decisions be made about who gets access to these drugs? Can we balance the high cost and uncertain evidence of these medicines against the dearth of other treatment options available to patients suffering from rare diseases? What STS tools and concepts can help us in these matters? This paper presentation reports on a scenario study geared towards helping drug coverage decision-makers in various Canadian provinces explore uncertain futures in this area. Furthermore, those explorations are subsequently used to draft recommendations for sustainable, fair, transparent and future orientated policy for DRDs. Abstract: Understanding algorithmic systems has become a key concern for policy-makers, engineers, and academics. But how do ordinary people make sense of something that is said to be inscrutable? What is the role of novel industries and intermediaries in mediating this relationship? And how do operators manage and respond to disobedience in the shadow of the engine? In this talk, I shall explore these questions through materials from ethnographies of search engine optimization (SEO) and credit scoring – and use these insights to rethink common tropes like bias, gaming, and accountability.